On Tuesdays, I answer questions about nutrition in NYU’s student newspaper, the Washington Square News. These appear intermittently on the newspaper’s website. Today’s is about caffeine. Question: What kind of effect does caffeine have on our metabolism and general health? What is an appropriate amount of caffeine to have? And are certain sources of caffeine better than others? Answer: Caffeine is a mild upper. It perks up your central nervous system and makes you feel more alert, energetic and cheery. Caffeine is common in plants, but coffee, chocolate and tea have the most. The amount of caffeine depends on the type, amount used and brewing time, from 30 milligrams for a small cup of weak tea to more than 300 milligrams for some of the larger and stronger Starbucks drinks. When caffeine appears on the labels, you know exactly how much you are getting. Energy drinks made for adults, like Red Bull, contain about 80 milligrams in an eight-ounce can. Coca-Cola, Pepsi-Cola and other soft drinks marketed to children have much less — 30 to 40 milligrams in 12 ounces. People react to caffeine in different ways and, by this stage in your life, you undoubtedly know how much of it you can handle and at what time of the day you can handle it. If you take in more than your personal limit, you may feel nervous, shaky and sleepless. The more caffeine you drink, the more you become accustomed to it and the harder it is to give up. Some researchers think that the mix of sugar with caffeine is what makes some people feel addicted to soft drinks. Perhaps it’s the caffeine in coffee that makes researchers want to find something wrong with it. I have a thick file of papers claiming that coffee raises the risk for heartburn, cancer, heart disease, infertility, ulcers and many other health problems, but the observed effects are small, inconsistent and unconvincing. When given as a drug, caffeine stimulates urine production and suppresses appetite, but the amounts in all but the strongest coffees are too low to produce such effects. If you get shaky when you drink caffeinated beverages, it’s time to stop. —A version of this article appeared in the Tuesday, April 10 print edition. 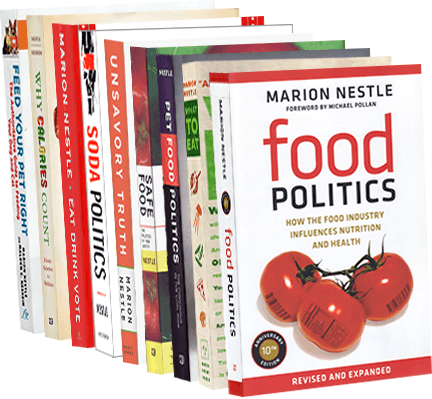 Marion Nestle is a contributing columnist. Email her questions at dining@nyunews.com. Additional note on the food politics of caffeine: SenatorDick Durbin (Dem-IL) has just asked the FDA to enforce its own rules on drink labeling. Some makers of high-caffeine “sports” drinks are marketing them as dietary supplements to avoid having to adhere to FDA rules on how much can go into soft drinks.